Simplistic background, not so good image quality. Oh well! furuba! nice work desu ^^~ good job on the BG and colors! It's simple and a lot of the time, simple is good ^^ Nice work. hehe i think it looks nice^^ good job! Nice wall~ Mmmm Oh how I love Haru and Kyou~! X3 They are too adorable! I agree, the positioning is superb. Good job, Taki. Nice title too. 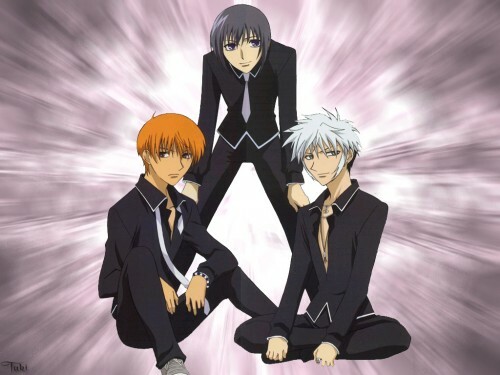 those three dudes are my three favorite guys in fruits basket!!! I also agree, this is the "handsome blossom trio" lol!!!! love the guys, there on my wallpaper!!! hohoooo ! ^_^ huhuhu ! Bishoneeeenn rules ^_^' ! I'm fan of Kyô (L) and Haru too lol ! Yay! Again this pic but with a different bg! Is great!